This week's tablehopper: peeling out. Oh, and Wednesday night, I finally got a chance to visit the latest pizza church, Una Pizza Napoletana, for a pie. Two words: mamma mia. Pommes dauphine with lobster butter. As soon as you wander into ~THERMIDOR~ on Mint Plaza, with one look at the Saarinen tulip fiberglass chairs, the little “reserved” signs on the white-tableclothed tables, the skinny black ties on the servers, and you’re like, “Yes, I’d like to begin my meal with a cocktail. Maybe two.” (Your fear factor for butter should drop in a few moments as well.) The vibe all fits with the mad-for-Mad Men zeitgeist happening right now—no comment about any affairs you’re suddenly inspired to embark on. Owners Bruce Binn and Neil Jorgensen (Spork) obviously have an affinity for the way things were. As you peruse the menu under the light of the chrome Sciolari chandeliers, you could easily make a night of all the $6 hors d’oeuvres. My favorites are the pommes dauphine—hot, fluffy, potato croquettes with a custard-like filling that you dunk luxuriously into the accompanying lobster butter (seriously, bring me a spoon so I can finish every drop). The chips and caviar may not fill you up, but they’re like a mini-trip to New England, a perfectly crisp chip topped with smoked trout, little pink roe, a dollop of crème fraîche, and a brunoise of shallot. While I was excited to see celery Victor on the menu, the kitchen’s fried take on the execution came out a bit sodden, and the celery was too fibrous. The crostinos, a trio of thick crostini with a slathering of shredded short rib “ragu,” were dry and coarse to eat—a bit indelicate compared to the luxe touch of the other options. Spork regulars will be happy to see the well-executed goat cheese fritters on there. 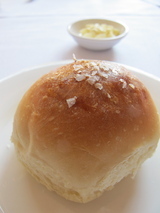 And another item everyone is fired up to see: chef Binn’s Parker House rolls (the man has a way with carbs—his pastas are also always notable). I adored the Caesar salad ($10), a clever presentation with the crisp and cool romaine cut crossways, covered with a flurry of breadcrumbs, Parmesan cheese, and a feisty, garlicky dressing. (I just wish the server asked if I’d like some fresh cracked pepper—this is exactly the kind of place where I want to see the BIG grinder come out.) The Cobb salad ($14) I had at lunch, however, didn’t wow me with its deconstructed presentation: a Cobb is good (in my book, at least) by the alchemy of all the ingredients coming together, the blue cheese dressing, the egg, the avocado… This salad was too much work. Shall we talk about the butter? Okay, let’s. The namesake Thermidor ($32) was intense, a sliced half of lobster baked in its shell, and then finished with a brandy-béchamel sauce. It was so rich, I could only bear a few bites—and while I know that Maine lobster was sourced with love and care, I don’t think this execution does the crustacean justice. The lobster-potato gratin on the side was so damned good, but I couldn’t help but feel like it was out to kill me. My accompanying carrots were also taking a swim in the deep end of a pool of butter. Another butter bath was the lobster roll ($17) I had for lunch—while the brioche bun was a thing of beauty, ditto on the tender lobster, the entire presentation was just overtaken with butter—I could feel it in between my teeth when I took a bite. Since the opening pastry chef, Kyle Caporicci, has moved on, I’m not going to go into the desserts since we’ll have to see what direction the pastry program goes in. One cool new thing they’re doing is a little lunch stand on the Plaza, where you can pick up carnitas tacos, or a fried chicken sandwich (follow their Twitter feed for updates). Speaking of lunch, there are a few tables that look out onto the Plaza—request them if you can. I like the lively U-shaped bar, with plenty of seats so you can get into some trouble with the well-executed and fresh cocktails ($9)—I think it would be a great first date spot or post-work meet-up for drinks and bites. (There are also some nice beers to choose from—although I find the wines by the glass clock in as too spendy—the cocktails are oddly a better deal.) And while the lighting of the dining room is slightly dim and atmospheric, the rustic (and, er, anachronistic) panels of Douglas fir from an old church in Oakland and concrete elements keep it masculine—I could see closing a deal over a pork chop here. What kind of deal? Well, that depends on whether we’re talking about dinner with Pete Campbell, or Don Draper. You’ve probably seen the mustache around town and wondered aloud, “Who is that?” It’s us, Scoutmob! We’re scouting the coolest local businesses and getting you in the door with rad discounts. And the best part? You don’t put one dollar down until you’re paying your final, discounted bill. We have an iPhone and Android app, so you have the deal in your back pocket 24/7, 365. You can also text it to yourself. Get on our email list to be in the know on everything local. We’re celebrating our launch on a weeknight in late October with a blow-out, bumpin’ party in SOMA. Drinks, food truck, music, and shwag! And you’re invited! tablehopper is giving away one pair of tickets (two tickets total). All you need to do is forward today’s tablehopper newsletter to one friend (but even more would be so very fabulous), and add a note to your friend(s) about the event, then Cc: or Bcc: me at luckyme@tablehopper.com so I know you sent it—I promise I won’t use anyone’s email address. The deadline to enter is Thursday October 14th by 11:59pm. I will notify the winner on Friday the 15th. Good luck! All content © 2010 tablehopper, LLC. I am more than happy if you want to link to my reviews and content elsewhere (thanks, glad you dig it), but republishing any part of them in any way, shape or form is strictly prohibited until we talk first. Please take a look at my Creative Commons license for more detail.